This is the hardest part of making this pickle. You need to peel the turnip, carrots, onion, courgette and the apples, and then cut them into 1cm (a bit under half an inch) dice. Top and tail the celery, and cut that into 1cm squares. Peel and mince the garlic. Put everything into a large saucepan and add enough water to just cover everything. Bring to the boil, then place a lid on it, turn down the heat and simmer for half an hour. Remove the lid - by this time your root veggies should be cooked but still with a bit of a bite, and the soft fruit and veg should be turning to mush. Check for seasoning, and continue to simmer without the lid until you reach a gooey kind of consistency. Sterilise 3 or 4 jars and their lids by totally submerging them in water and boiling them for 10 minutes. When the pickle is ready, let it cool down to the point where it's not giving off any more steam (or is cooled completely), spoon it into the jars, put the lids on and stick them in the fridge. The pickle is ready to eat as soon as it is cool, but will improve with age and will keep indefinitely in sealed jars. The video above is from the Keef Cooks YouTube channel. 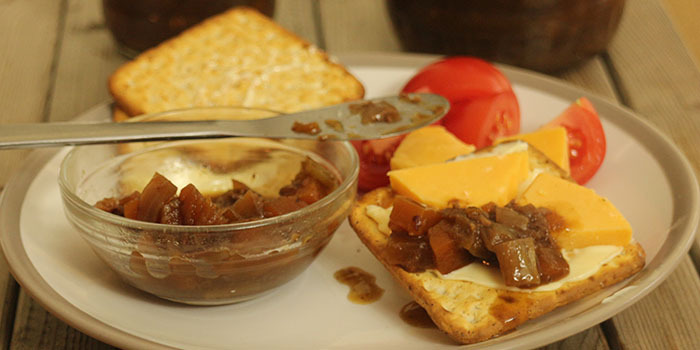 Click here to see the video recipe of Ploughman\'s Pickle on YouTube.